The floodgates have opened. After months of extreme secrecy, Paramount Pictures has at last started distributing real images from their new Star Trek movie, showing everything from the new Kirk and Spock, to exploding starships, to crew photos, to Eric Bana as the movie’s Romulan villain Nero! Is that a nerve pinch? Hard to tell, odd camera angle. Why does Spock look angry? The U.S.S. Kelvin, a ship design similar to the Enterprise. Eric Bana as Romulan bad guy Nero. Kirk crawls out of what looks like an escape pod. Pod is marked NCC-1701, so it is from the Enterprise. Are they blowing it up already? Kirk in his command chair! 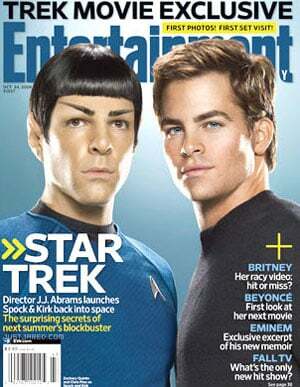 Star Trek takes over Entertainment Weekly! On newsstands this Friday.